Going on safari is at the top of many a traveler’s bucket list and we’re so excited to have checked that item off our own bucket list, more than once. Coming face to face with Africa’s Big Five is truly a memorable and exhilarating experience. You’ve probably heard of them and seen them on TV. The Big Five – the African elephant, Cape buffalo, leopard, lion and rhinoceros – are said to be the animals that safari-goers would most like to see, though the origin of the name is much more sinister. It’s definitely possible to go on a Big Five safari and see them all. We’ve seen all Big 5 animals on safari in Tanzania and four of the Big 5 in Kenya. Other countries where Big Five game viewing is possible are Botswana, Ethiopia, Malawi, Namibia, Rwanda, South Africa, Uganda, Zambia and Zimbabwe. How did the African elephant, cape buffalo, leopard, lion and rhinoceros come to be called the Big 5? The name came to be in the hunting heyday of the 19th and early 20th centuries when even American presidents and royalty considered it a rite of passage to go to Africa and bag a dangerous animal as a trophy. The Big Five animals became known as the most dangerous animals to hunt on foot. The name was eventually also adopted by safari tour operators for marketing purposes and hopefully these days the only “shooting” being done is through the lens of a camera. Four of the Big Five are on the endangered species list, which makes them even more special to see. Once you’ve spent time on safari watching elephants wallow in watering holes, lions bond in their prides and if you’re lucky enough to get close to rhinos, you can’t help but wonder how anyone could want to kill these majestic animals for sport or a horn or tusk. Lions and leopards are vulnerable with populations declining. The African elephant is also vulnerable, though with conservation efforts the populations are rising. The African elephant, despite the ban of sales of ivory in many countries, remains vulnerable because of poaching and loss of habitat. The rhino, particularly the black rhino, is a critically endangered species. Some rhino sub-species have gone extinct already in our lifetime, and the remaining sub-species are at critical risk due to the decimation of them from poaching rhinos for their horns. It’s believed, particularly in Asia, that the rhino horn can help with impotence and is used in Chinese medicine – which is ludicrous. A rhino’s horn is made of keratin, the very same material that forms our fingernails and hair. The Cape buffalo is of the least concern as they are plentiful and numbers remain largely unchanged. 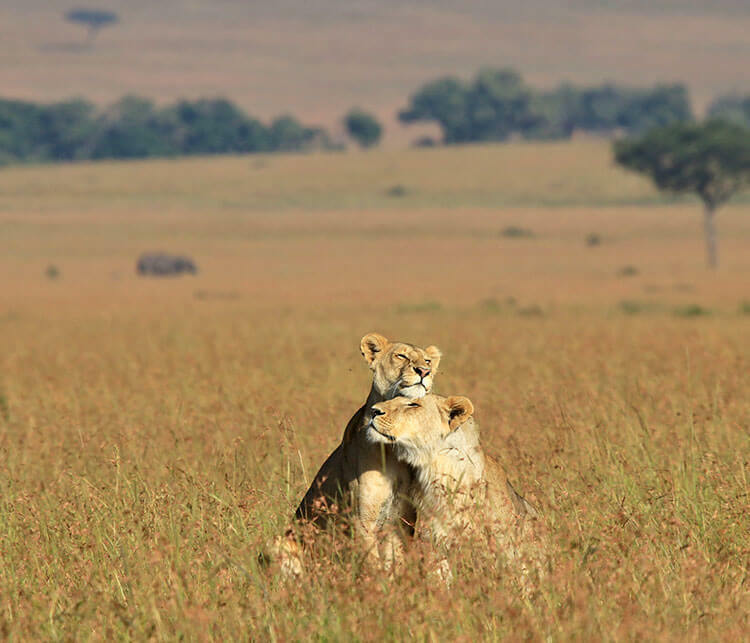 Synonymous with an African safari, the lion is the most sought after animal of the Big Five to spot while on safari. They are the king of beasts, after all, and have no natural predators…except man. We were surprised to learn that even the king of beasts has a hard life and because of it, wild lions only live to around 12 years of age. They spend up to 20 hours of each day just resting to conserve their energy. Lions have such little stamina that they need all their energy to hunt. We saw a lot of sleeping lions, but also were witness to a pride of male lions and one female that had taken down a Cape buffalo earlier in morning feasting on their kill and a male and female lion mating on our SkySafari by Elewana in Tanzania. And one of our favorite moments of our Masai Mara safari with Angama Mara was coming across a young male lion who had lost his pride. His call was almost heartbreaking. But a few minutes after we came across him, we saw some of his pride members climb up on a log to get above the tall grass. Once they all spotted each other, the pride rushed toward their lost member. It was all nuzzles as they welcomed him back. 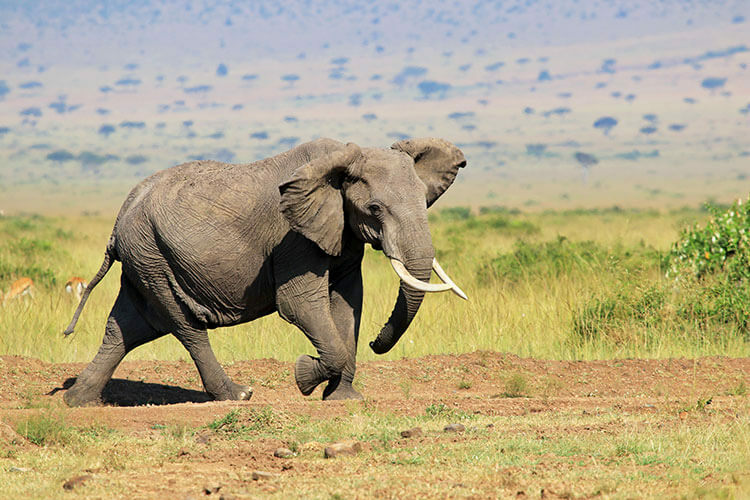 The African elephant is the world’s largest and heaviest land animal and they are truly spectacular to see in the wild. Huge herds abound, particularly in Tarangire National Park in Tanzania. Watching a herd play, splash, swim and dunk in a watering hole was one of our favorite safari moments. African elephants can weigh up to 7 tonnes and a good safari guide will know their behavior to distinguish a mock charge from a serious one. We saw plenty of mock charges from moms, aunties and cousins protecting the wee ones of their herd. It might surprise you to learn that the Cape buffalo is actually the most dangerous of the Big Five. They are very territorial and kill more people than any other of the Big 5 safari animals every year. It is said that impact of a Cape buffalo’s horns’ collision is equal to that of a car hitting a wall at 50 kilometers per hour. We were glad that the herds we saw were all more interested in munching away on the grass than charging us. We just had one lone Cape buffalo that was curious about us on a bush walk, but a ranger from Serengeti National Park ensured our safety and chased it off. Sadly, the black rhinoceros is classified by the IUCN as critically endangered and one sub-species, the Western Black Rhino, was recently declared extinct with the last one to be seen in the wild in 2006. 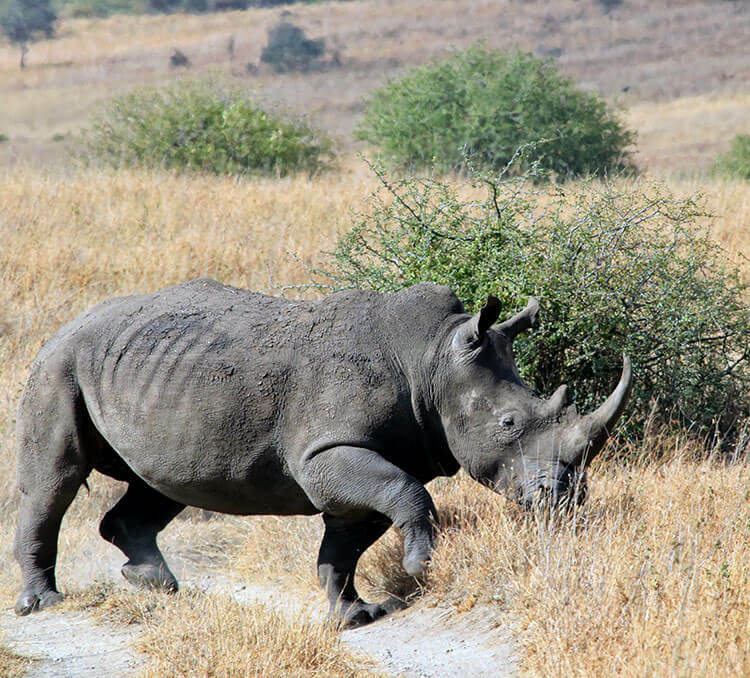 Less than 5000 black rhinos are estimated to live in the wild and just 26 live in the 260 square kilometers of Ngorongoro Crater Conservation Area. Poaching of rhinos for their horns is the biggest threat to the black rhino population. We consider ourselves very lucky to have seen even one, though we actually saw eight mostly from a distance while in Ngorongoro Crater. One of the best places to see both black rhinos and white rhinos is surprisingly Nairobi National Park. Kenya’s very first national park serves as a rhino sanctuary and the majority of rhinos located in Kenya were born in Nairobi National Park, then relocated to bolster rhino populations in other Kenyan parks and reserves. We saw a total of 11 rhinos there and got very close up with both black and white rhinos. Leopards are nocturnal and, unlike lions which live in prides of 5 – 25 lions, live on their own. 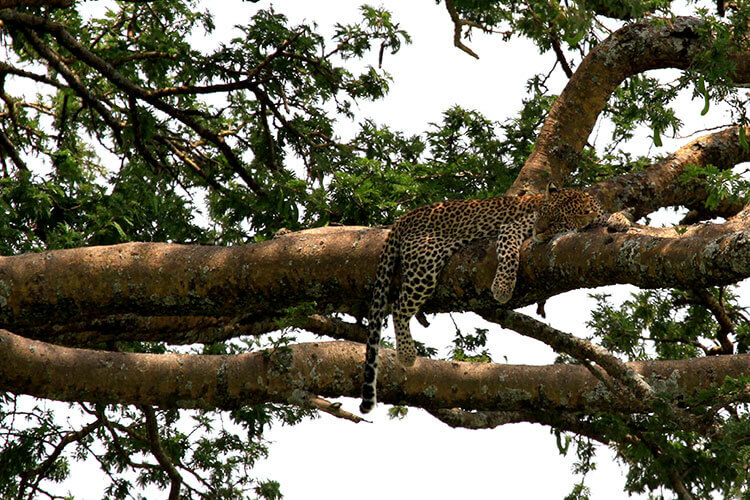 They like to sleep in trees and their spotted coat provides a very good camouflage. They are considered the most elusive and hardest to spot of the Big Five. We saw four in Serengeti National Park and even more rare, we saw two sleeping in the same tree, which our guide said were mother and cub. Leopards are excellent climbers and they’ll even store away their larger kills in trees in order to keep lions and hyenas from stealing their meal. Our guides told us we were very lucky to spot all of the Big Five on our very first African safari. Try as our guides did, we never did find a leopard on our second African safari to Kenya. Now we truly know just how lucky we were on that first trip to Tanzania. It must be truly amazing to see them in the wild. And thanks for sharing the information about the name “The Big Five”, I haven’t known that before. Loved following along on this adventure and LOVE that you got to see all of the Big Five! I’m dying to go! You will love it Anne! We can’t entirely check going on safari off our bucket list because we’re dying to go back already! It must have been so amazing to see those animals up close and in person, in the wild! It really was Lauren! There is just nothing like seeing them just being animals and doing their thing. Hi Jennifer! I love your post! I’m an Africa lover but actually I didn’t know about the origin of the expression “Big five”. So sad. I didn’t know where the name originated either before digging in to it. I agree it is sad and it makes me sick to see those photos in the news of trophy hunters with their lions and elephants. I can’t imagine wanting to kill these beautiful animals. It’s incredible that, still in 2014, in so called “civilized” countries like Botswana, hunting safaris are still possible. Nice post Jen, I’ve been on a whole bunch of safaris and it’s always an adventure because you never know what you’re going to end up meeting. One correction: the hippo is actually the most dangerous African animal and kills the most people every year. Hard to believe because they’re round and fat and everyone figures cute – but they are very territorial and have a nasty temper and huge jaws! That’s a classic photo with the elephant and the extended ears – I’m surprised your guide actually got in that close! Scary. There is a debate and it has been said both the hippo and the Cape buffalo are the most dangerous animal. Cape buffalo are also very territorial and fearless. We encountered both a hippo out of water and a Cape buffalo on a bush walk – the hippo was definitely more afraid of us whereas the buffalo was aggressive and stalked us a bit. I think we caught this elephant when it was flapping its ears to cool itself as they do. These ones definitely were very relaxed when we were around. There were other cheeky elephants that gave us some warning charges though! Splendid – great photos and wonderful animals – my husband tried to photograph such animals too when he was in South Africa with his job. Now there’s a great place to “have” to go for work! Glad to hear he sneaks in a little time to take in the sights, Lori. No, hippos aren’t part of the Big Five. But they are pretty fun to see! Serengeti Migration Camp is located right next to the Grumeti River and we had about 70 hippos take up residence while we were there. We’d giggle every time we heard them communicating with their grunting. We have plenty of hippo action coming up and a video of a hippo out of the water too. Thanks Michelle! The rhinos were quite shy. We saw about half the population that live in Ngorongoro, but mostly from a distance. At the end of the day we got lucky with a rhino that wandered closer to the roads. Great pictures and that is awesome you got to see the big five. I hope to as well when I visit next year. I love the leopard in the tree picture; lucky you! Where in Africa are you going on safari Marsha? I’m thinking Kenya and Tanzania for sure. Woohoo, the Big Five! So lucky…….I know many people who have gone on safari without being so lucky. I also saw all five, with the leopard being the hardest one to spot of course Great photos here…it’s been too long since I was in Africa, I want to return!.